We are specialized in garage doors and openers sales, installation and repair since 1960. Our team’s mission is to exceed customers expectations every day, and we do our best to reach it. To help you with your garage doors in Enola, contact our professional and experienced team at 717-901-4056. How could you update the look of your house? Enola is a beautiful, peaceful small town located just across the river from the state's capital, Harrisburg. If you are looking to have an outstanding house style, buying a new garage door is an excellent way to achieve it. 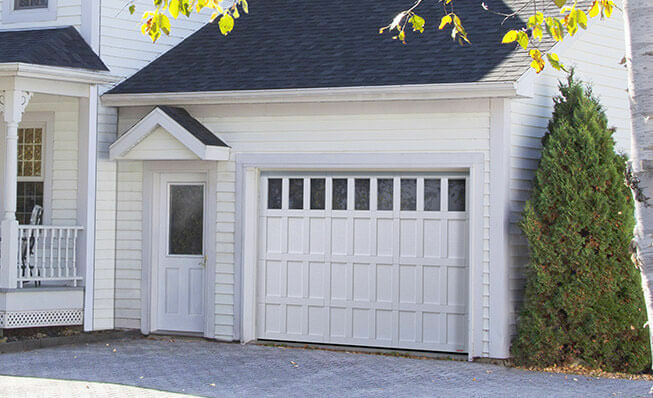 Whether you want a modern or Craftsman design, we have the garage door you are dreaming of. Our image gallery is full of ideas to help you choose the right door. Are you facing an emergency with your garage door or opener? At Baker Door Company, we offer a 24‑hour emergency service to help you in this kind of situation. For any trouble, from broken spring to a door that wants not open/close, call 717-901-4056 or fill out the online form. We serve Enola, Hershey, Shiremanstown, Harrisburg, York, and other locations. We repair the majority of garage doors and openers. To be efficient in doing it, we have in stock replacement parts for many different doors and openers types. Are you looking more to refresh the look of your actual door? We also have many styles of decorative hardware for you. Come to visit our showroom to choose the hardware that will match best your house style. The Standard+ Series is perfect to meet Enola homeowners’ needs. A garage door opening represents a large opening in your home's thermal barrier. Insulated doors will help to stop the cold or heat coming from the outside entering your garage, thus reducing the amount of energy required to cool or heat your home. If you need someone for a garage door installation in Enola, think to Baker Door Company. The LiftMaster products work well for residential, commercial, agricultural and industrial garages. These openers are reliable and make the door more convenient. Because we know that you want to use the best products, we have many LiftMaster openers available. Our technicians can give you personalized advice to choose the one you need for your garage door in Enola. Central Pennsylvania area including Harrisburg, New Cumberland, Shiremanstown, Mechanicsburg, Carlisle and more.